Alan Stubbs is confident Scott Allan will still be at Hibs to spearhead their Championship title bid in the upcoming season. The talisman, who has a year left on his contract, has been persistently linked with Celtic and Rangers this summer, but Stubbs is entirely comfortable with the situation and is adamant there is no pressure whatsoever on his club to accept any offers for last season’s Championship player of the year. “The position is that Scott’s a Hibs player,” he said. “I’ve heard about the speculation and I’m delighted at that because without it then it means we don’t have good players. When you have good players there’s always speculation. Hibs have been in talks aimed at tying down Allan on a longer-term deal, but Stubbs is content to allow his star man to run down his contract, help Hibs try and win promotion and then assess his options in a year’s time if that is what he would prefer to do. “We’ve been in negotiations and would like him to sign a contract but I respect his position as well,” he said. “He knows what we want him to do but there is a mutual respect there. The negotiations have just been ongoing. There’s been no pressure, we’re comfortable with it and always have been comfortable with the situation but Scott Allan is a Hibs player. “He’s at a big club – we’re not talking about us being a really small club. I understand the size of Celtic and Rangers but Scott has flourished in this group of players and there has been a really good chemistry between the both of us. He’s got himself back on the right track and I don’t see any reason why that should change. “If Scott decides to let his contract run down, we’re respectful of that. Scott is going to be here for the rest of the season and after that he is a free agent. We’re the ones that are controlling this situation. If that’s the case, we’re prepared to let that contract run out for the next year, although we would like him to sign a new deal because he is integral player for us. Although he has been monitoring midfielders anyway in order to bolster his squad, Stubbs insists he has made no specific contingency plans for any potential Allan departure. “We haven’t looked at a Plan B,” he said. Yesterday’s news about Fontaine signing a new two-year deal was particularly pleasing for Stubbs as he admits he would have struggled to find such an accomplished centre-back elsewhere if the Englishman had chosen not to return to Edinburgh. 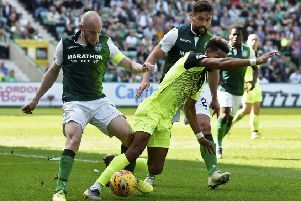 The 29-year-old wore the captain’s armband occasionally in the absence of Liam Craig and David Gray last season and Stubbs confirmed that, with Craig now having left the club, Fontaine will effectively be deputy captain to Gray. “Liam Fontaine signing is great news for us,” said Stubbs, who celebrated his first year in charge of the club yesterday. “He was brilliant last season and was probably one of the players the fans wanted to get signed up. He had other offers and it wasn’t easy. I’ve been in contact with him quite a bit over the summer and I’m pleased we got it over the line. I was very keen to get it done.